For over 25 years PRO TEC International has been supplying the music industry with cases and bags designed by musicians for musicians. In 1984, our designers came up with a true winner when they introduced the uniquely innovative PRO PAC case line. Since its introduction, these sturdy, lightweight, shock resistant cases have become the leading choice among musicians that demand the best in protection and convenience. 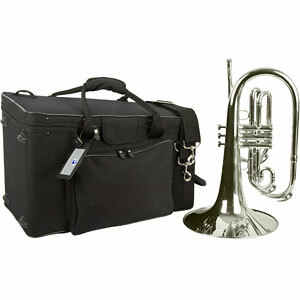 Protec's Pro Pac Case takes the trapezoidal case concept and converts it into a light weight portable casing alternative for bell-front mellophones. The case ships with a shoulder strap, but a backpack strap can be purchased as an accessory, further making this case an attractive accessory for mellophonists who tire of lugging around heavy cases by the handle. Protec's Pro Pac Case is light weight (8 pounds) and a great alternative for stock mellophone cases. The case is constructed well. It's light (weighing in at eight pounds) and easy to carry. This is a padded wood case covered in nylon. It utilizes zipper closures for the top lid and for a convenient side pocket. 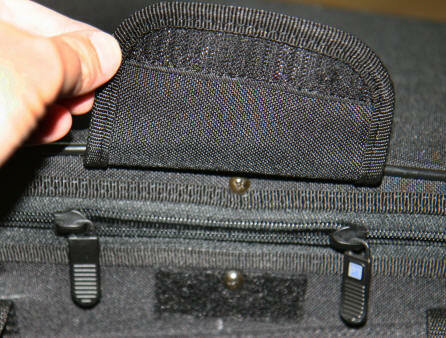 A nice detail of the Pro Tec case is a velcro flap that protects the zipper that secures the case coaver. The foam blocks affixed to the inside of the case cover will gently press against the mellophone when the lid is closed, keeping the instrument snug and secured in place. There's little to no room for storage of accessories in the case, which is probably by design. Overpacked cases often result in damage to the instrument. 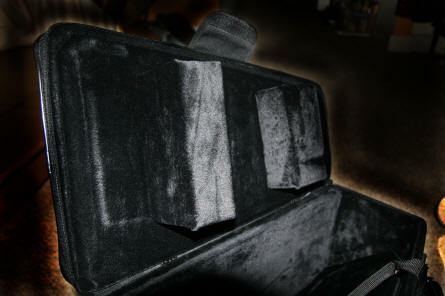 The mellophone fits snugly in the case, supported at a list by an angled floor panel. The instrument is held securely in place in transit by two soft blocks affixed to the underneath of the case lid. Priced at around $150 (check the web for deals from distributors), the case is a somewhat significant investment for an amateur musician and most likely an option for all-age group mellophonists who own their own instrument. I ordered mine directly from ProTec's online store and received a free mouthpiece pouch that is coming in quite handy. Protec Pro Pac Cases for marching mellophones can be purchased directly from the manufacturer (Click here). Click here to find an authorized ProTec dealer near you.